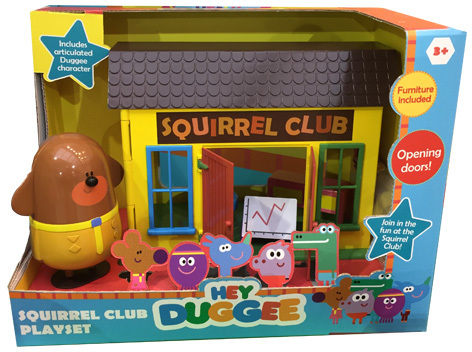 The Squirrel Club is at the heart of hit CBeebies show Hey Duggee. Featuring a large articulated figure of Woof Woof Duggee who’s a cross between a dog and a tutor, this playset is the perfect toy for all the shows preschool fans. Made by Golden Bear, the building contains all the furniture like desks and chairs, whilst the front opening doors allow all the characters in and out. These include Betty the imaginative octopus, Roly the hyperactive hippo and Tag who’s a thick skinned rhino. Please tell us what you think of the Squirrel Club Playset by Golden Bear.